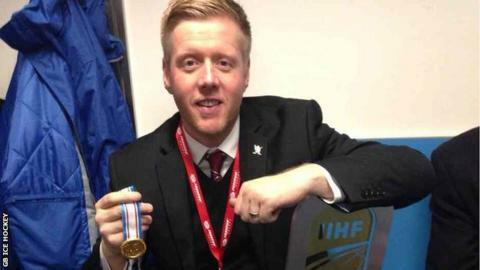 New head coach Pete Russell intends to take his time building a successful Great Britain men's ice hockey team. The 40-year-old Scot from his role as head coach of the GB Under-20s. "We're just restructuring things just now. In the long run, we've got to be aiming for things, but in the short term we have to see what we have as a pool of players," he told BBC Scotland. "We can see who fits into our criteria and the quality of player we want." Russell has proved his talent at developing younger players and has now been given the opportunity to show what he can do with the senior squad, who are ranked 22nd in the world. Having won four gold, one silver and two bronze medals in 11 tournaments in charge of the Under-20s and Under-18s, the Scot is Britain's most successful junior coach. He took up ice hockey aged 12 in his home town of Ayr and played professionally as a netminder before coaching English Premier League sides Swindon Wildcats and Slough Jets, as well as GB age-grade teams. He will combine his new role with completing the season at the Okanagan Hockey UK Academy in Swindon, where he coaches the country's most promising 16 and 17-year-olds in all aspects of achieving success in the sport. "It's a 10-month programme," Russell explained. "We have kids from Germany, Hungary, England, Scotland and Latvia. "They train every day. It's a fully professional programme. We play in the UK and also travel to Europe to play." When asked what he considers his coaching strengths to be, Russell mentions being organised and knowing what he wants, but above all, he wants his players to show a desire to exceed. "I think I'm very passionate," he said. "When you're playing sport, if there's no passion, there's no point in having you in the team. "People have to want to be there. I think players see my work-rate and feed off it a bit. "I'm pretty passionate about trying to build something here. I've got to give everybody a good chance and watch as much hockey as I can and evaluate it with the rest of the coaches and make sure our rating system is right. "We don't have the best players in Europe. We know that. "But that doesn't mean we can't be a better team and we can't compete. We must try to do everybody proud." Russell's first major competitive challenge is the second-tier IIHF Ice Hockey World Championships in Eindhoven in April. Great Britain are in Division One Group B and will play Croatia, Estonia, Korea, Lithuania and the hosts, Netherlands. He hopes a few Scots from Braehead Clan, Fife Flyers, Dundee Stars and Edinburgh Capitals might push for inclusion in his squads. "There are possibilities for some," he said. "In Braehead, there's Ben Davies and Zach Sullivan is a player who came through the junior programme. "Ryan Finnerty and Gareth Chalmers [general manager] are doing a great job. "Fife have got a couple of players. There's Paul Swindlehurst in Dundee who is not long back from Canada. "He was trying out in North America, but it didn't quite work out for him. "Scottish hockey seems to be growing again, it's great to hear. "Braehead are doing a fabulous job. It's very family orientated. It's fast and furious and it's something people could get into in Scotland."